Liturgical poet and astronomer; lived at Avignon in the second half of the fifteenth century. He was the author of a liturgical poem composed at Avignon in 1462 (published, with the religious controversy of Jehiel of Paris, at Thorn in 1873). 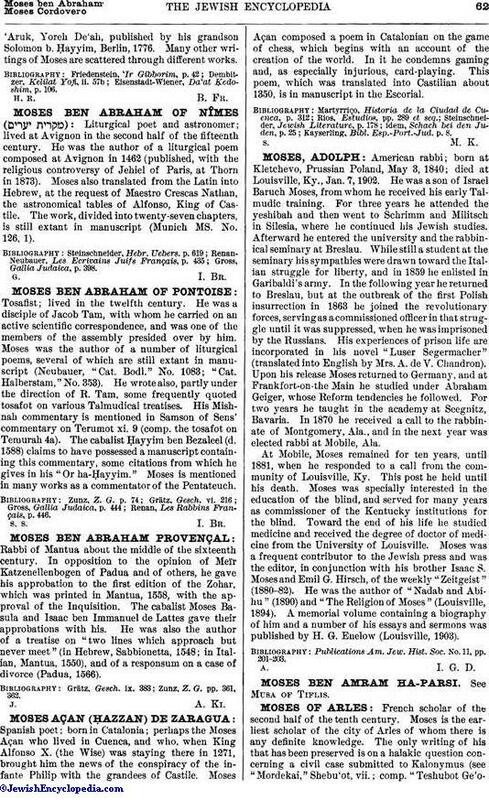 Moses also translated from the Latin into Hebrew, at the request of Maestro Crescas Nathan, the astronomical tables of Alfonso, King of Castile. The work, divided into twenty-seven chapters, is still extant in manuscript (Munich MS. No. 126, 1). Gross, Gallia Judaica, p. 398.